Click here for our free printables and activities in honor of Flag Day, June 14. 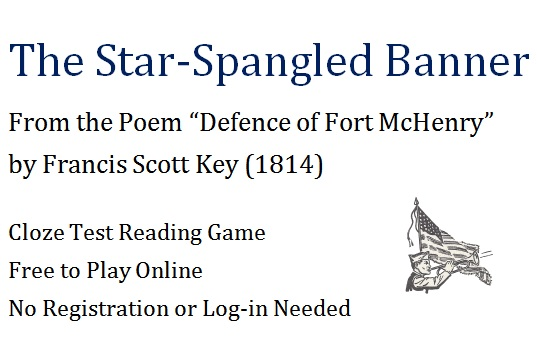 Complete the lyrics of "The Star-Spangled Banner," written as "Defence of Fort McHenry" by Francis Scott Key in 1814. Click the box to see the possible answers. O'er the ramparts we watched, were so gallantly 2._____gleamingsteepbravevauntinglypollutionwaveconquerpreservedmistsstreamingtriumphmottonightfreemenpeacestreamhavochirelingreposes ? O'er the land of the free and the home of the 5._____gleamingsteepbravevauntinglypollutionwaveconquerpreservedmistsstreamingtriumphmottonightfreemenpeacestreamhavochirelingreposes ? Their blood has washed out their foul footsteps' 13._____gleamingsteepbravevauntinglypollutionwaveconquerpreservedmistsstreamingtriumphmottonightfreemenpeacestreamhavochirelingreposes . Praise the Power that hath made and 18._____gleamingsteepbravevauntinglypollutionwaveconquerpreservedmistsstreamingtriumphmottonightfreemenpeacestreamhavochirelingreposes us a nation! And this be our 20._____gleamingsteepbravevauntinglypollutionwaveconquerpreservedmistsstreamingtriumphmottonightfreemenpeacestreamhavochirelingreposes : "In God is our trust."